The 2017 Kansas high school football season has come to a close as state champions were crowned in all eight classes this past weekend. Three teams highlighted as preseason No. 1’s in the Kpreps.com rankings captured state titles this fall. Three other classes were won by teams ranked No. 4 or No. 5 in our preseason poll, while 3A champion Sabetha and 8M-I champion Hoxie were unranked to begin the season. Hoxie was actually ranked sixth in the preseason poll by number of votes received. Let’s take a look at the final rankings for the 2017 season. 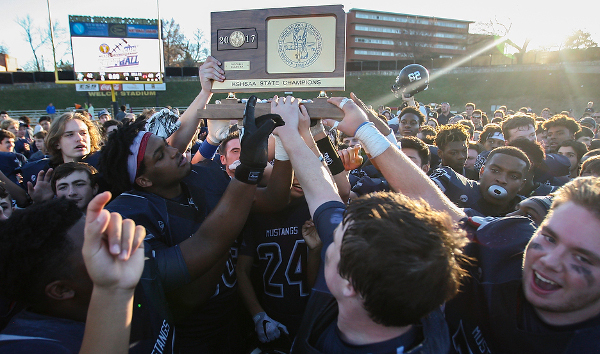 Blue Valley North captured the school’s first ever state football championship with a 49-42 win over Derby. The Mustangs denied Derby a third consecutive Class 6A crown thanks to the efforts of junior quarterback Graham Mertz. Mertz passed for 462 yards and four touchdowns, but his 15-yard touchdown scramble with :57 seconds remaining proved to be the winning score. Derby finishes second in the Class 6A poll followed by Lawrence Free State, Wichita Northwest, and Blue Valley. In Class 5A, Bishop Carroll returns to the top of the classification after a 38-28 win over St. Thomas Aquinas in Saturday’s state title game. Carroll quarterback Braden Howell passed for 327 yards and three touchdowns and added two more rushing scores in the victory. The title is the third for Bishop Carroll in the past six years. Aquinas finishes second in the 5A poll followed by Goddard, Mill Valley, and Maize. Bishop Miege cruised to a fourth consecutive 4A, Division I state championship with a 53-21 47-7 victory over Andale. The Stags were led by senior quarterback Carter Putz who passed for 327 yards and four touchdowns while rushing for 106 more yards and a score. The final 4A-I poll includes De Soto at No. 2, followed by Andale, McPherson, and Buhler. Holcomb captured its second Class 4A, Division II state championship in the past three years with a 40-20 victory over Frontenac on Saturday in Salina. The Longhorns took advantage of five Raider turnovers and quarterback Trey Gilbert threw four touchdown passes in the win. Frontenac finishes No. 2 in the final poll followed by Scott City, Topeka Hayden, and Smoky Valley. In Class 3A, Sabetha captured the third state football championship in school history with a dramatic 7-6 victory over Marysville. Marysville had the ball at the Sabetha 7-yard line with approximately 30 seconds remaining, but Gabe Garber came away with a game-clinching interception at the goal line to secure the victory for the Bluejays. Marysville finishes at No. 2 in the Class 3A poll followed by Phillipsburg, Silver Lake, and Galena. The Smith Center Redmen captured the ninth state football championship in school history with a 43-7 victory over St. Mary’s Colgan on Saturday night. Smith Center’s nine state titles ties Kapaun Mt. Carmel for second in Kansas history behind Lawrence High’s ten titles. St. Mary’s Colgan finishes second in the poll followed by Olpe, Centralia, and Jefferson County North. Hoxie captured the school’s first state football championship with a 54-14 victory over St. Paul. Latham Schwarz carried 33 times for 204 yards and four touchdowns in the victory. Hoxie used its incredible size to control both lines of scrimmage. The remainder of the 8-Man, Division I poll has Spearville, Saint Paul, Burlingame, and Central Plains. In Eight-Man, Division II, the Hanover Wildcats were able to repeat as state champions and extend their current winning streak to 25 games. Hanover built a 48-14 lead in the third quarter, but had to withstand a furious rally by Hodgeman County to hold on for the 54-48 victory. The state football title was the fifth in Hanover’s history and the fourth in the past ten years. Hodgeman County finishes second in the poll followed by Pike Valley, Otis-Bison, and Mankato-Rock Hills. See our complete Rankings for further details.